This year the Christmas countdown, the never ending checklists, the holly that stings me every time I take it in the wrong way, the songs you have to listen to and the movies you have to watch otherwise it is not Christmas are stressing me out. I’ve always embodied a pristine Christmas spirit, but I fell this race against time to tick all the boxes before Christmas as a stressing activity rather than an enjoyable one. If I could postpone Christmas of a week, close everything that is pending and start my personal marathon of cookies, movies and traditions, I would do it. As we do not hold the secret of turning back time, all I can do is just live Christmas on my own terms. I’m trying to savour Christmas following my own rhythms. It took us three days to trim the Christmas fir: the baubles do not match, as it happens with the socks after the laundry. There are tinsels that I brought from home, as my favourite pink and pistachio cupcake bauble, trinkets that Tommaso chose from the box of his family decorations and others that we are buying together during every trip, from Antwerp, a delicate red and white glass mushroom, to Berlin, where we bought a bright yellow Snoopy bauble. It is a tree in progress, just like us. Gifts are ready, most of them home made season by season: jams, compotes, dried fruit preserved in alcohol and candied orange peel dipped in dark chocolate. Now it is just a matter of choosing the best gift from the pantry for each friend. I’m looking forward to the weekend, once I’ll self proclaim holidays at Juls Kitchen, when I’ll finally have time to wrap and decorate the other gifts. Maybe then, and only then, I’ll put on some Christmas music. We have defined the Christmas Day menu: as every year everyone will contribute something. It reflects the tradition, but mostly our preferences. What I am really looking forward to, though, is the silence of the night before Christmas. You will hear just the rustle of the paper used to wrap the last gift and the low crackling of the fire, which slowly dies out. By contrast, I await with the same excitement the chats and laughter which will explode the next day, on Christmas morning, all gathered around a table where our two families will meet, with a creative and joyful clash of culinary traditions. Pork and cod, artichokes and spinach flan, cartellate, fried dough soaked in honey from Puglia, and the mellowest ricciarelli from Siena will share the same table. I’m also looking forward to those moments that will follow Christmas, my days in a bubble, when I intend to enjoy the gift that I have carefully chosen for myself, a few days of idleness at home. It will be time to cook nurturing food just for us, to make room for the new year in wardrobes and in the party, on shelves and into drawers, to scribble down projects and intentions, to read and write. This year I live the magic of Christmas as a reflection of the beauty of winter, with its white light, the crackling fire, the bitter vegetables and the candied fruit in every seasonal sweet treat. This makes me see the holidays from a different perspective, a rather relaxing one. Therefore, as every year, I choose the side dishes as my favourite Christmas course. Obviously I can’t avoid baking the traditional Christmas sweets of my area, I have already prepared my yearly dose of panforte, cavallucci and ricciarelli. We will spend a day making fresh pasta, all the family gathered around a table, busy hands making tortellini as we learnt during the summer in a day spent with some ladies of the Tuscan-Emilian Apennines. Although I absolutely adore all of this, I’m partial to the side dishes. On any other day I would consider these side dishes as main courses, filling and loaded with vegetables, but in these days of celebrations the vegetable flans, the fennel gratin and the three-time-cooked cardoons become those dishes that you always try to keep aside, serving them sparingly, to be able to enjoy the leftovers in the evening. Leftovers taste always better. Flans have always been the dish that can not be missed on our Christmas table. Over the years our main courses evolved from the ’80s baked salmon to a more traditional boiled meat course, from stuffed roast chicken to arista alla fiorentina, but never, ever, we sat at the Christmas table without baking a vegetable flan. This one is made of artichokes, pureed and mixed with ricotta instead of bechamel, but it remains just as soft, rich and festive as we expect from a Christmas side dish. Add a sprinkle of sliced almonds in the last minutes of baking for a elegant touch of crunchiness. Clean the artichokes by removing the tougher outer leaves, then quarter them and place them in a pot. Use also the stems, removing the outer part, and cut them into small pieces. Cover the artichokes with water, add two tablespoons of olive oil, the cloves of garlic and the salt. Cook the artichokes over medium heat, covered, for about 30 minutes, or until they are so soft that they can be easily pierced with the tip of a knife. Drain the artichokes and purée them with a stick blender, then collect the artichoke purée in a bowl. Add the ricotta, the grated pecorino romano and the beaten eggs. Season with salt and pepper and mix well. Grease and dust with breadcrumbs a 20 cm round tin.Scrape the artichoke and ricotta purée into the tin, dust with breadcrumbs then drizzle with extra virgin olive oil. Bake the flan in 200°C hot oven for about 50 minutes. In the last 10 minutes of baking sprinkle the surface with slices of almond, then bake until the flan is golden brown. Let it rest for at least 30 minutes before serving. It keeps well for a day in the fridge: you'll just need to reheat it before serving it. it can be frozen. * If you can't find fresh artichokes, you can substitute them with frozen artichoke hearts. As for my family you can not call it Christmas without a flan, I have plenty of flan recipes to shares. Here you have three flans that you can bake to serve with a roast chicken, a roast beef or even an oven baked salmon. the spinach flan. It is reassuring and cosy in its creaminess, intriguing thanks to the crunchy crust, the most desired bit at the table. The spinach flan is a side dish that doesn’t steal the scene to the main course, but accompanies it, dressing whatever it is on its Sunday best. the cardoon flan. It might take some time to clean all the cardoons, but its delicate artichoke taste is worth of it. the green bean flan. Although green beans are a typically summer vegetable, we often make good use of a bag of frozen beans to make this flan. 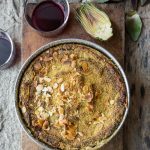 You can follow the method used in the spinach flan recipe, which is the more traditional, blending the green beans and mixing them with the béchamel, or you can make a lighter version, with ricotta and almonds, as in this recipe. In Tuscany, the traditional Christmas meal involves a capon, being it boiled or stewed with tomato sauce, and cardoons. Capon and cardoons are a close-knit couple just like Simon and Garfunkel, Hansel and Gretel, Bonnie and Clyde. In addition to the traditional flan, you can also stew them in the capon tomato sauce – first boil them, then fry them, then put them back into the capon tomato sauce to stew – or you can cook them in the pan with eggs. It takes courage to call them a side dish, they look more like a meal on its own, but for Christmas everything is allowed. I would serve them with a capon stewed in tomato sauce, with a roast beef or even with the stuffed rabbit. The Christmas menu should feature a salad, if only to add a fresh and citrusy note in between to richer courses. This salad is colorful and wintery, it really complements a roast chicken. If your main course is pork-based, though, choose fennel as a side dish. You can prepare a Mediterranean salad, with thinly sliced fennels, segments of blood oranges and black olives, or prepare a gratin, with lots of garlic and lemon. Clean the fennel by removing the harder outer part and cutting the base. Rinse and cut into 4 or 6 wedges, depending on the size. 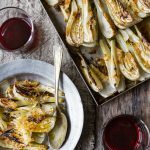 Place the fennel on a baking sheet, so that they are arranged in a single layer. Mince the garlic and put it in a small bowl. Add the grated lemon zest, the lemon juice, salt, pepper and the extra virgin olive oil. Mix the dressing with a fork and pour it on the fennels. If you want to Beto season each wedge, brush the seasoning with a kitchen brush. Cook the fennel for 30 minutes, then sprinkle with the grated Parmesan cheese and cook for another 20 minutes. Turn off the oven and leave the fennel there for about 10 minutes, then serve hot. Which are your favourite Christmas side dishes? What are you going to cook this year? I know the feeling of not accomplishing what you set out too at the beginning of the season but sometimes I think we think baking is all we have to do. We know that is not true. I had about 6 different cookie recipes of yours on my list-did only 3-Cavallucci, ricciarelli and today the pan forte bites. They all turned out wonderful. The pan forte is different than the typical but then tart and sweetness complement the nuts so well. Very tasty!! Always have a sformata at the holidays but may need to try your flan or gratin next time-maybe for New Years. 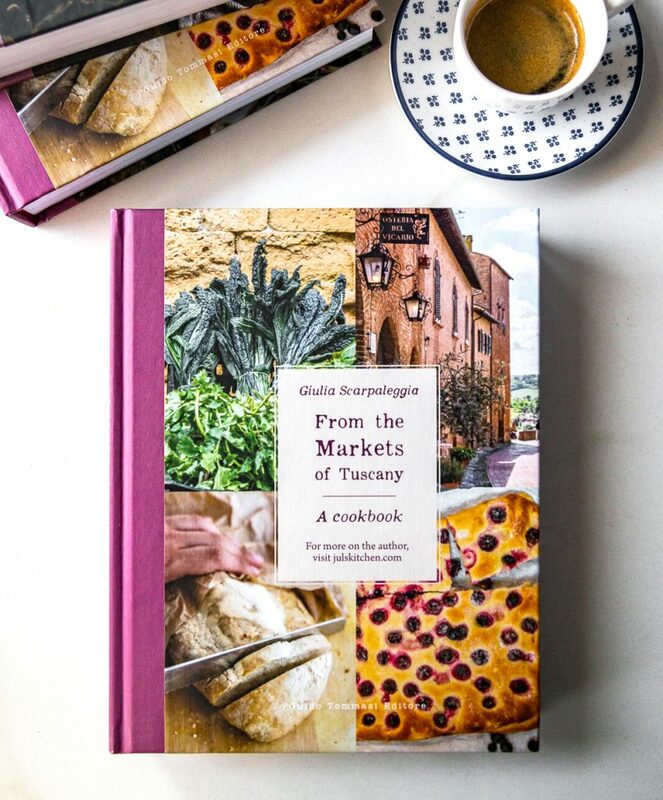 Love your recipes, love your stories. Merry Christmas and Happy New Year. next post: Butternut squash and lamb meatballs. A recipe for you.